This document explains how to set up the physical parts of the product. Complete these steps before you install the product software on your computer. If you already set up the product hardware, and need software installation help, see Links to Software Installation Instructions at the end of this document. Follow these steps in order. When you are finished, you can click the appropriate link at the end of this document if you need instructions to install the product software. CAUTION:Do NOT connect a USB cable now. If you plan to use a USB cable to connect the product to the computer, you will be prompted to connect it at the correct time during software installation. Lower both the paper tray and the cartridge door. Remove all packing material and protective film from the product. NOTE:Do not connect the USB cable. Connect the power adapter to the back of the product. Connect the power cord to the power adapter. Connect the other end of the power cord to an alternating current (AC) power outlet. Follow the instructions on the control panel display to set the default language and country/region for the product. Press the colored buttons to the left of the display to select the up arrow ( ) or down arrow ( ) icons on the display until your language is selected. Press the colored buttons to the left of the display to select the up arrow ( ) or down arrow ( ) icons on the display until your country/region is selected. Leave the product turned on and follow these steps to install the cartridges. Open the cartridge door. Make sure the carriage moves to the center. If it does not move to the center, turn the product off, and then turn it back on again. Remove the cartridges from their packaging, and then remove the pink protective tape from both cartridges. CAUTION:Do not touch the copper-colored contacts or re-tape the cartridges. Hold the cartridges with the label on top. Insert the tri-color cartridge into the left carriage slot and insert the black cartridge into the right carriage slot. Press the cartridges firmly into the carriage until they snap into place. Press OK to confirm the installation of genuine HP cartridges, when prompted. NOTE:Make sure all the paper in the stack is the same size and type and free from rips, dust, wrinkles, and curled or bent edges. Slide the paper-width guide inward until it stops at the edge of the paper. When you install a new cartridge, the product aligns the cartridges. You can also align the cartridges at any time using the product software. Aligning the cartridges helps produce high quality output. Follow the instructions on the control panel display to print the alignment page. Load the alignment page face down in the front right corner of the glass. Close the lid, and then press OK to complete the alignment. After you complete the previous setup steps, you can install the product software with the product CD or by downloading the software from the HP Web site. For instructions, click the link for your computer operating system. CAUTION:For USB connections, do NOT connect the USB cable yet. You will be prompted to connect it at the correct time during software installation. HP printers are, at a very basic level, a piece of hardware, or a device, that receives and executes printing-related commands. The printer works with software and drivers to process and carry out your commands. Keep reading to learn how drivers work with the HP printer. What is a print driver? Think of a driver as the manager and translator for your printer. When you tell your printer to print something, you are sending it a command. The driver works with a translator to translate your command into a language the printer understands, directs the printer what to do with the command, manages other tasks the printer might be doing, and instructs the printer to carry out your command. The drivers control the device and communicate with other hardware devices that you have installed on your computer. In more complex terms, drivers are small software programs that help control devices attached to your computer. Drivers enable your operating system and other software to communicate with various hardware devices, controllers, and other peripherals. Why do I need a print driver? Your HP printer doesn’t know what to do without a driver to manage it. Without a driver to translate, manage, and execute your commands, a printer can't do anything. It needs guidance. Also, drivers help computers identify and run installed hardware (printer). Without drivers, computers cannot distinguish between a sound card and a modem. Most computer devices and peripherals need drivers to run, which means that computer accessories, like printers, also need drivers to function. Choosing and installing the correct drivers for your printer is often a key component of computer system configuration. What does it take to make a print driver? The specific printer model. Many printers have variations within a range (series). For example, the HP Photosmart 4200 has 11 different models within the series. Each of these models requires a variation on the print driver. The operating system (OS) on the computer. Print drivers are different for Windows XP, Windows Vista, and Windows 7, even for the same printer. Of course, Mac operating systems require different print drivers as well. The features that the connection type supports. The way the printer is connected also contributes to the variations in print drivers. 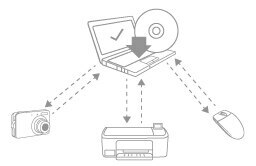 Printers that are connected with a USB connection require different features than a printer connected to a wired (Ethernet) or wireless network. The features of the printer. Features like automatic duplexing (printing on both sides of the paper), multiple paper trays, faxing, scanning, and copying all have their own sections within the print driver. Each unique functionality requires a set of instructions specific to that printer. The printer's command language. Printers and computers communicate with each other using command languages. These languages are unique and contribute to the need for unique print drivers. The print mechanism. Many printers have different ink cartridges, nozzles, and printheads, all of which make up the print mechanism. This also requires a unique print driver. So, for models that are similar to other models, it might not be as time consuming to create a driver. But if a printer has a new mechanism or other new features, it can take over a year to create a new driver. Then, print drivers all have to be tested individually, which is the most time and labor intensive part of the process. Where do I get HP print drivers? Software CDs. HP ships CDs with its printers, and it is a good idea to hang onto them for future use. InOS drivers. Especially for newer operating systems, like Windows 7, there is already a basic driver included in the operating system. Should I use the CD, download, or use the inOS driver? CD installation is a quick and easy method. If you do not have a CD, you can download the software you need. Drivers included in the operating system (inOS) are quick and easy to install. CD installation might not work ifyou are installing the product on a computer running a newer operating system that released AFTER the HP product released. For example, Windows 7 released in 2009. If HP manufactured your product prior to that year, the CD that came with the product might not work correctly on a computer running Windows 7. Downloading the software provides the best results for your older product.Eventhough it takes more time than using the CD, downloading the latest software can help you avoid installation issues. Using the inOS driver might not include all of the features you want. Alsothese drivers are not available in all operating systems, nor for all products. The software on the CD is current to the date of the product release. The software you can download from the HP Web site is most current software available for your product. HP often updates software and drivers AFTER the product and CD release to the market. With this basic driver, the buttons on the product do not function and some of the advanced product features are not available.